Peter Westbrook: Fencing champion; champion of life. Pre and postwar Olympic games competitor between 1976 and 1996, Peter Westbrook is not only a champion fencer, he is also a champion of life. His childhood was one of abuse and desperation. He was known as a street fighter and a thief. His talent for fencing literally changed his life. His mom talked him in to giving it a try and he never looked back. He went to his first Olympics as the youngest in the US team at the age of just 22. The Peter Westbrook Foundation was created in 1991 and is dedicated to helping children growing up in similar circumstances that he did, through lessons in both fencing and in life. Between 1976 -1996 qualified for every single American Olympic fencing team. 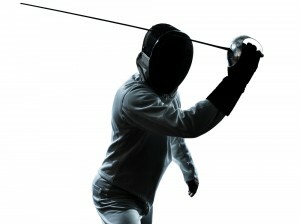 Interested in fencing or fencing equipment. Need fencing instruction. Well. Click right here.